The concentration of CO2 in our atmosphere has now risen from 290 ppm, recorded at the beginning of the industrial revolution, to 405 ppm today. We are now confronted with the problem of how best to curb this increase and meet the demanding CO2 reduction targets of the 2015 Paris agreement. To rise to this global challenge, one of the strategies proposed, which forms the centerpiece of this symposium, focuses attention on different ways of utilizing CO2 as a chemical feedstock for making chemicals, materials and fuels. The “CO2 Chemistry Solutions to Climate Change” symposium will bring together the world’s leaders in scientific research and economic solutions to turn this vision of a CO2 economy into a reality. 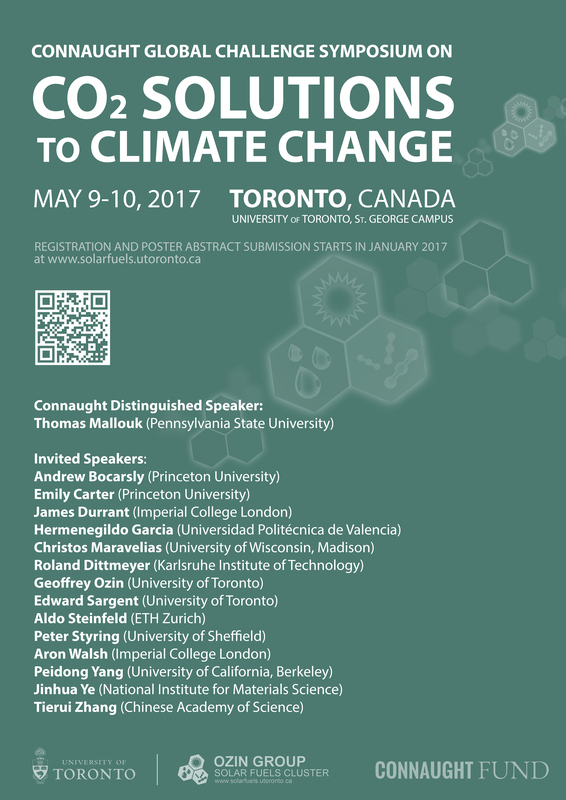 Join us on May 9-10, 2017 at the beautiful downtown University of Toronto campus to be a part of the discussions! Refreshments will be provided during coffee breaks. Prizes are awarded to best student posters! © UofT Solar Fuels Cluster. All rights reserved.